Recognizing the need for tools to address critical cleaning in aerospace and military installations, the company developed a range of cleanroom mops, wipers and detergents to serve the emerging cleanroom industry. With its CR 100 PC tape, the company was the first to develop specially processed cleanroom tape for controlled environments. In recent years the company has broadened its product range to meet the needs of aseptic processing in pharmaceutical and biotechnological sites. 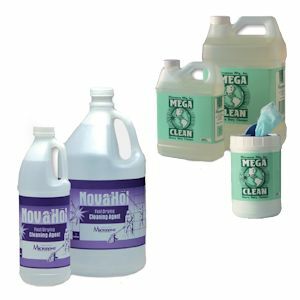 All-Purpose General purpose cleaning products for a wide range of applications. Lab/Glass Cleaner Laminar flow benches, Cleanroom Curtains, Glass and Acrylic surfaces. Stainless Steel Cleaner For cleaning stainless steel surfaces in controlled and support environments. No matter what industry you work in, it’s important to have a clean space to ensure your employees and clients are safe. At SOSCleanroom, we’re passionate about providing our customers with the best cleanroom supplies and cleaners on the market, and we have the supplies you need to keep your workplace pristine. Once you’ve found the cleaner you’re looking for, be sure to browse our cleanroom wipers, swabs, mops, garments, and gloves.You can also search for cleanroom supplies by brand, including ITW Texwipe, DuPont, and Chemtronics.